Before I get to the food portion of my Wednesday post, I would like to discuss something on my mind that is neither food nor real estate related. Yesterday was one of those ridiculously long days that started with a dash out the door at 7:12 AM in four inch heels and ended with a barefoot, purse dragging along the ground shuffle in (Jonas, sobbing and clawing at the bottom of my skirt to be carried) at 6:47 PM, and with an encore of 3.5 hours of laundry before I could pass out. The laundry situation is what I would like your advice on. Have you seen that show Fringe? It has Pacey from Dawson’s Creek in it. You know which one I’m talking about. And the old guy in it is hilarious. It’s a pretty good show. This show deals with weird stuff like people moving from one dimension to another and doppelgangers and whatnot. This season I think there are two Olivias (one of the main characters) because both Olivias from the two dimensions are currently in the same dimension. I know, you’re wondering how this relates to my laundry. Ok, so here’s the thing: I’m starting to wonder if my family from the other dimension has somehow made it over here to our dimension and is living in our house and wearing our clothes and I just hadn’t noticed it yet because they’ve each managed to not ever be in the same place at the same time as their doppelganger. Except for the laundry. There’s just way too much of it and it’s beyond suspicious. I think that may have been the ‘other’ family’s fatal error; because now I’ve figured it out. Exhibit A: The underwear piles – My laundry system (if you can call it that) is as such: I run laundry regularly and dump the clean loads on the floor in the master bedroom (so if anyone really needs something before it gets put away, they’re welcome to dig through the clean piles). Then once or twice a week I spend several hours folding and putting everything away. Last night was my big laundry night because the cleaning people were coming this morning and everything needed to be off the floor. After I spent about two hours folding everything and organizing it into piles so that it could all be put away properly, I stepped back and took a look at the sheer magnitude of each of these piles. And then I counted the number of pairs of underwear in my middle son’s stack. It totaled 16. SIXTEEN pairs of underwear in less than one week. Now I can understand this if I was counting my youngest son’s pile, because he is still in the final stages of potty training and therefore has a valid reason for wearing multiple pairs of underwear a day. But my middle son is six, and should only be wearing one a day, right? Do any of you change your underwear more than once a day? Because that’s weird, if you do. Exhibit B: My husband’s t-shirts – OK, so I maintain that it’s been less than a week since I’ve laundered the household, but I was sick over the weekend and effectively lost two days, so let’s give him the benefit of the doubt and say it’s been just over a week since I’ve put away all of his shirts. We’ll say I was working with 10 days of shirts for him last night (although I guarantee you it wasn’t near that many). And let’s also take into consideration that probably 30% of the time I wear one of his shirts to bed. So we’ll even give him credit for 5 of the shirts I put away last night to be from my own usage. We need to also remember that he’s a sweaty guy, so he probably changes his shirt once a day (which is reasonable to understand). So doing that math (and everything has been healthily rounded up, please keep in mind) I could expect to put away about 25 shirts last night, right? In fact, when I asked him to guess how many I had just put in his closet, his first guess was 15. The actual number, however, was a whopping 43. FORTY-THREE shirts of his that I washed and put away. And ohmygod that doesn’t even include the white t-shirts he wears under his regular shirts to catch his man-sweatiness. Obviously the only explanation for all of this is a doppelganger family wearing all of our clothes and depositing them into our dirty clothes hampers. Or that I have a boyfriend who wears my husband’s clothes that I’ve mentally blocked out because I’m morally opposed to cheating on my husband. But that wouldn’t explain Gray’s excessive underpants-usage. Must be the doppelgangers. So what should I do about this? Any suggestions? That’s Tyler Florence’s Ultimate Stuffed Potato. We watched the episode where he made it once and were sold. We make them pretty regularly because the kids love them. 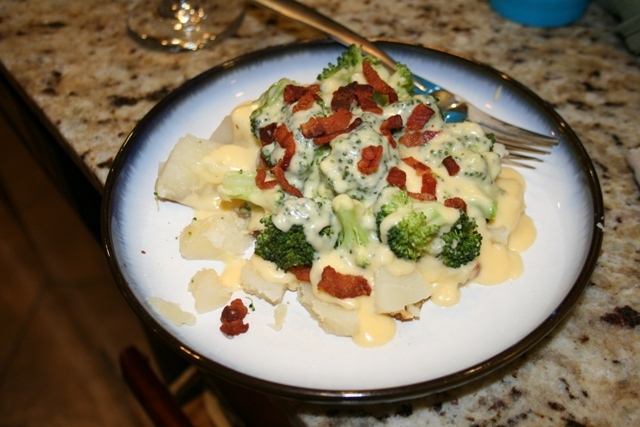 You can follow the recipe, but basically you just bake the potatoes, steam the broccoli, fry the bacon and then make the cheese sauce using a rue (equal parts flour and butter simmered into a creamy paste, constantly stirring), heavy cream and shredded white cheddar (although apparently when I was grocery shopping this week I grabbed a sharp New York yellow cheddar instead accidentally, and it was just as good in the sauce last night). So it’s a hearty, easy, throw together meal my whole family will eat. It is not low-fat. But hey, my unicorn chef didn’t make it either (he’s out of town visiting his mother who lives in Des Moines). The real problem is that your family has too many clothes. I don’t even *have* 43 t-shirts, and I’ve been collecting them WAY LONGER THAN JASON HAS BEEN ALIVE. Gray, on the other hand, is just a little personal-hygiene obsessive, which is the right end of the scale to be on if you have to be on one end or the other. I’m with JT. Why in the world does Jason own that many shirts??? Even with Ryan’s super sweatiness, and going to the gym like 5 days a week, I don’t think he goes through half that. And I love to change my undies frequently. Aren’t you glad you know? maybe Gray is like Katie and feels he should change his underwear every time he changes his outerwear…once in the morning from jammies to clothes and then once in the evening from clothes to jammies. Which means 8 days of unders to get to 16? or. you know. doppleganger family. obviously the plausible second choice. I would get a lot more laundry done if I could remember to move the load from the washer to the dryer so I didn’t have to keep rewashing the same load 5 times since it sat in there overnight and now smells musty. I would also probably have a lower water bill. *distractionary** topic switch so you won’t notice how much I’ve babbled about NOTHING in your comments. All I have to say is you are a nice wife & mother to do all that laundry & put it away! I don’t even do my own laundry! I’m with the rest. Just don’t have that many clothes and you won’t have that many to put away. And I remember when certain children in OUR household would not put their very nicely folded clothes away that I had lovingly laid on their beds so to respect their closet and dresser privacy and they would throw them in their hamper because they were too DAMN lazy to put them away and they knew it was once again laundry day. Mention that to KC next time you’re talking to her okay? 🙂 So maybe Gray is just doing that.